Right from the time I suggested the topic of Sindhi women to Mr. Ranjit Butani, the torch bearer of the movement called ‘Sindhi Shaan’, my path was filled with a lot of excitement. I discovered that a Sindhi Woman can be charming and full of good vibes, despite the impression I had. Prof. Popati Hiranandani, for instance, left no stone unturned to provide me with detailed information and the insight into Sindhi Women and as a bonus I also experienced motherly love. Mrs. Sundri Uttamchandani was another such goldmine of wisdom and so was Mrs. Kala Prakash, Ms. Maya Rahi and Dr. Kamla Gokhlani. All this at just one phone call! 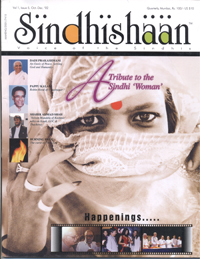 And not to miss the efforts of Mrs. Rita Shahani who penned down her lovely article on Sindhi Women writers. I admire each one of them because of their dedication towards the community and duty towards womanhood. I received a warm welcome from each and every Sindhi dignitary that I approached. Dr. Indra Hinduja was among the first I went to, and her ability to provide solutions is highly commendable. So also was Ms. Neeta Lulla who gave complete information about the Sindhi woman with respect to her dressing sense; Spotlights on Sindhi Food were thrown by Ms. Camilia Punjabi, while I was filled with admiration at the passion Ms. Karuna Samtani had about parenting and giving her children the most valuable thing “time”. Anju Makhija was extremely helpful in not only suggesting a topic for debate but also contributed in lots of other ways for this issue. Asha Chand, Rani Jethmalani, Indu Shahani…. and many more contributed towards enhancing the beauty of this magazine. While the articles of the Matlani brothers provided genuine insight into a Sindhi woman, Dr. Moti Prakash’s piece of poetic wisdom added a flavour of sweetness to the issue, well supported by the sketches of Mr. Hiro Hingorani. My path not only became easier but was laid with roses, for the fact that I am the son of the grand old man of the Sindhi Community, Mr. Kirat Babani, whenever I picked up the receiver of my telephone and called anyone in the Sindhi Society, they greeted me saying “Kirat jo put aahin, chao put, hukum kar”. And the rosy path was made rosier by my ‘Commarade-in-Arms’, my wife Sabita, who has always been there for me in not only this issue but all my life. And finally the Big Boss Butani who actually made it all happen, making a piece of coffee table chat into a full blown coffee table collector’s item. This man is a master at growing dreams in his back yard! These three months that I spent doing this special number on the Sindhi woman, I guess are and will always be one of the most unforgettable times of my life! We at Sindhishaan pay respects to the spirit of Sindhi women, the Sadori, the Daahi, the Niyani, and wish her success and happiness from the bottom of our hearts!